By Dan Ambrose: If you look at World Boxing Council (WBC) middleweight champion Julio Cesar Chavez Jr’s recent 5th round TKO win over Peter Manfredo Jr. last November you’ll see some of the changes that Chavez’s trainer Freddie Roach has made with Chavez’s old brawling style of fighting. For the first time in his eight year pro career, Chavez Jr. used foot movement to circle the ring and avoid some of Manfredo’s attacks. 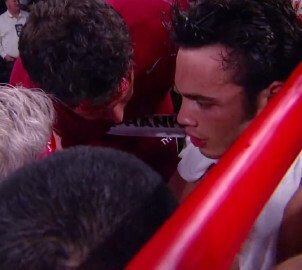 Chavez Jr. like a completely different fighter in what clearly was his best performance of his career. However, if you look closely at that fight, Chavez Jr. still looking to pay Manfredo back each time he was hit with anything significant. Chavez Jr. had all the advantages in the fight – youth, size, power and speed. Manfredo Jr. was pooled from the bottom of the WBC rankings, although the WBC quickly pushed him up to the top five by the time the fight took place in November. Manfredo was really just another B level opponent to fight just like most of the others. In his next fight, Chavez faces Marco Antonio Rubio (53-5-1, 46 KO’s) on February 4th in San Antonio, Texas. This is going to be a tough fight for Chavez Jr. and it could be a 50-50 bout where either can win it depending on who has the better power and strategy. Rubio punches a lot harder and has the better experience. However, Chavez, 6’0”, will be sporting a two inch height and likely a 20 pound weight advantage in the fight. At 25, Chavez Jr. is younger and a lot bigger than Rubio. You can make an argument that Chavez Jr. really should be fighting at super middleweight right now because he’s coming into his fights weighing over 170lbs. In his bout with Sebastian Zbik last year, Chavez Jr. weighed 180lbs by the time he entered the ring. Chavez’s trainer Freddie Roach is likely going to be giving Chavez Jr. instructions to use his jab and try and box Rubio instead of slug with him. However, Chavez Jr. is the type that likes to try and prove a point by going out and beating his opponents at their own game. He’s also got a stubborn streak in him to where if he gets hit, Chavez Jr. always fires back with his own power shots to try and get even. If he fights like this against Rubio, it could backfire on Chavez because he’ll be fighting Rubio’s type of fight. Like Chavez Jr., Rubio is from Mexican and his game is centered on his power and his tendency to slug. Rubio is just more suited towards slugging than Chavez Jr. because he has better power with both hands and is better skilled as well. So if Chavez Jr. tries to stubbornly go to war with Rubio, he could end up getting knocked out in front of a huge Texas crowd. Chavez Jr. is too stubborn for his own good and all that soft matchmaking done for him has likely got him convinced that he’s better than he actually is. Rubio will bring Chavez Jr. down to earth unless Chavez Jr. listens to Roach and avoids exchanges with Rubio.